Assembled Outdoor Radio - ARC Wireless 5GHz Dual Polarity 23dBi/24dBi antenna, LED window, ECS Ethernet Connector System, Mikrotik RouterBoard, radio, and POE supply. Designed for high quality 802.11n service. 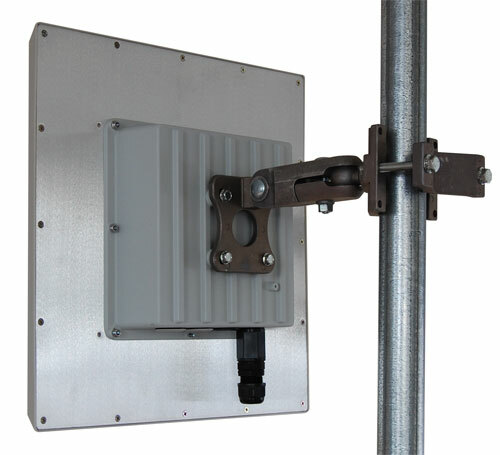 This high quality outdoor radio system is ready to install as a customer CPE, an Access Point (requires RB/411A or RB/411AH), or in a Point to Point configuration (requires two units). The enclosure is die cast aluminum. The RouterBoard is securely mounted and grounded. A viewing window shows RouterBoard LED illumination. The mount is heavy duty, high quality alloy and fully articulating in all axis. Select RouterBoard, Radio, and Power Supply options below. Select Antenna Polarity as you want it shipped. Polarity can be changed later by removing eight nuts and rotating the antenna element. Note: These are built to order and require some assembly time for completion. We might not be able to ship your order same day. Please call ahead if next day delivery is required. Mikrotik's Wireless FAQ can be found here. OEM Mikrotik Rack Mount Kit for RB4011 Router - black finish with screws Mikrotik PL6411-2nD 802.11b/g/n WiFi AP with a single Ethernet port and capability to connect to other PWR-LINE devices - New! Mikrotik LHG LTE kit (product code RBLHGR&R11e-LTE-US) is an outdoor radio device for remote locations that are within cellular network coverage - with 1 SIM slot - New! The Mikrotik wAP 60G (RBwAPG-60ad) is weatherproof integrated 60 GHz wireless unit, that can be used indoors or outdoors in different scenarios - Point-to-Point or CPE 1m SMA male to SMA male cable Mikrotik ACGPSA is standalone active GPS antenna, that works in 1575.4 MHz spectrum - New!